A weather spoiled game in Firies resulted in a well deserved win 2-11 to 2-6 for Ballymac. Both teams exchanged opening points before Firies cut loose scoring 1-2 without reply. Ballymac needed to gain a foothold in the game and a beautiful cross field ball finished to the net put them back into contention. Suddenly another goal came out of nowhere and amazingly Ballymac led 2-2 to 1-4 at the half completely against the run of play. 5 of the 6 opening points in the second half opened the gap and looked to be leading Ballymac home but a well worked Firies goalleft only three points between the teams entering the final stages. Ballymac responded in kind chipping over three late points to leave the margin at 6 points in the end. Ballyduff was the venue for our County League div 5 semi final last Friday evening. We travelled with a full squad and were hopefull of a good showing.Playing into a strong wind and a packed Ballyduff defence made scoring chances scarce .Dylan Dunne Moriarty was dominant in midfield, and was helped by strong performances from Adam Joy, Jonathan Lowe, and Daire Leen. Despite a lot of hard work we only had 3 points on the board at the break, from D Dunne, J Lowe, and D Broderick. Half time score Ballyduff 1—5 Ballymac 0—3. Ballyduff upped their game considerably in the second half, and we were 1—9 to 0—5 behind midway through the half, D Dunne and D Broderick our scorers. Our physically stronger opponents took over in the final ten minutes running in 3—3 while Luke o Connell got a consolation goal for us. Final score Ballyduff 4-12 Ballymac 1—5.Almost all our current squad are minors again next year and will be that bit stronger and more experienced. Team E Kenny, C Brosnan, C Godley, J Baily, J Lowe (capt) A Kelly, D Sweeney, D Dunne Moriarty, B Cassidy, S Horan, D Broderick, D Leen, A Joy, C Coggins, D Daly, SUBS L O Connell, D Mchugh, B Godley, J Kenny, R Mchugh. 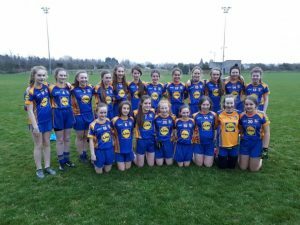 Our u 16s travelled to Castlegregory to take on the locals in round 2 of the Central Region Division one League on Monday night last. Selecting to play with a stiff breeze our boys were quick off the mark and took full advantage of the wind to race into an early lead. We were leading 1-09 to 0- 02 after twenty minutes: our goal coming from the boot of Sean Horan . We continued to pressurise the opposition and were rewarded by a further goal from Adam Joy and some wonderful points from Adam Sheehy, Adam joy and Sean Horan to put us into a commanding lead on a scoreline of 2 13 to 1 02 at half time . Castlegregory responded well early in the second half and scored 3 unanswered points . However our boys were not to be denied and went on to score 2-04 without reply , the goals coming from Donal Daly and Adam Sheehy . Castlegregory replied with two goals of their own and added 3 further points . Ballymac emptied the bench at this stage and continued to impress right to the end and finish strongly on a final scoreline of 7- 22 to 3-12 . An all round excellent display from the boys from Ballymac with some excellent performances on the night : Luke O’ Connell & Adam Walker were impressive in defense , Daragh Sweeney and Adam Kelly impressed at midfield, Denis Brosnan was in excellent form in defence & equally in midfield in the second half . Adam joy lead the scoring with 3-07 , some of the point scoring was sheer class . Donal Daly finished with a tally of 2- 03 and his work rate was outstanding. Adam Sheehy 1 -04 , Sean Horan 1-02 Maurice O’Connell 0-02 Gary Lynch 0 -02 and Conor Brick 0- 01. Thanks to all parents who travelled and supported the team on the night. 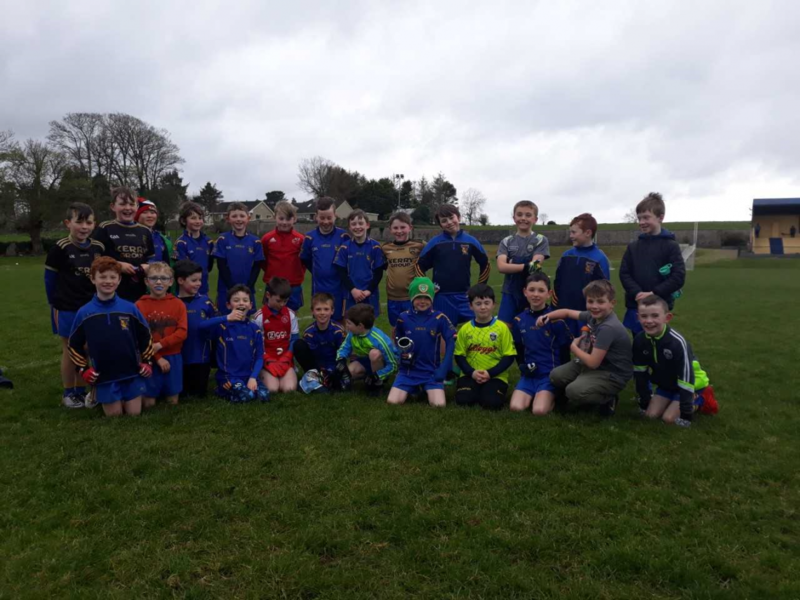 Our u14 Boys were out on the double on Wednesday evening last with the Blue team travelling to Ardfert while our Gold team welcomed Miltown /Castlemaine to Ballymac. In Ardfert spectators were treated to a fantastic game of football as play swung from end to end,we had the better of the opening exchanges and built up a good lead midway through the first half, the home side came more into the game as it progressed and finished the stronger to emerge victorious on a 5-19 to 5-11 scoreline. The Gold team were always in control of their game and some of their play was a joy to watch with great combination between the u14s and the younger u12s who moved up to make up the team. Final score in this game was Ballymac 5-20 Miltown/Castlemaine 2-5. This weekend attention turns to Feile, we are in the B section in a group with Churchill and Beaufort. The games will take place in Ballymac on Saturday afternoon with our first game against Churchill at 2pm. Our focus will then switch back to the Co League where on Wednesday evening next we travel to Killarney to play Killarney Legion. 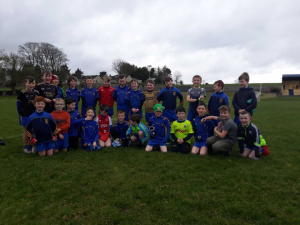 Ballymac U10 Boys had a good turn out on Sunday morning, those to impress were Fionn Enright, Kyran Boyle, Shane Cassidy, Jimmy Healy and Patrick Leen. Well done to player of the week. Well done to all the boys who turned up to training this morning. It was cold and windy but our U8 boys soon warmed up running around the field. Well done to our player of the week Dara Leen. The Lotto draw this week took place in Ballygarry House Hotel. The numbers drawn were: 18, 22, 23, and 24. 1. Martin Lowe, Farmers Bridge. 2. Eoin O’Sullivan, Caragh Lake. 3. Matt Browne C/O Tom Leen. 4. Catriona Leen C/O Paula Silles. We are very grateful to our Lotto Sellers and All Our Lotto supporters. 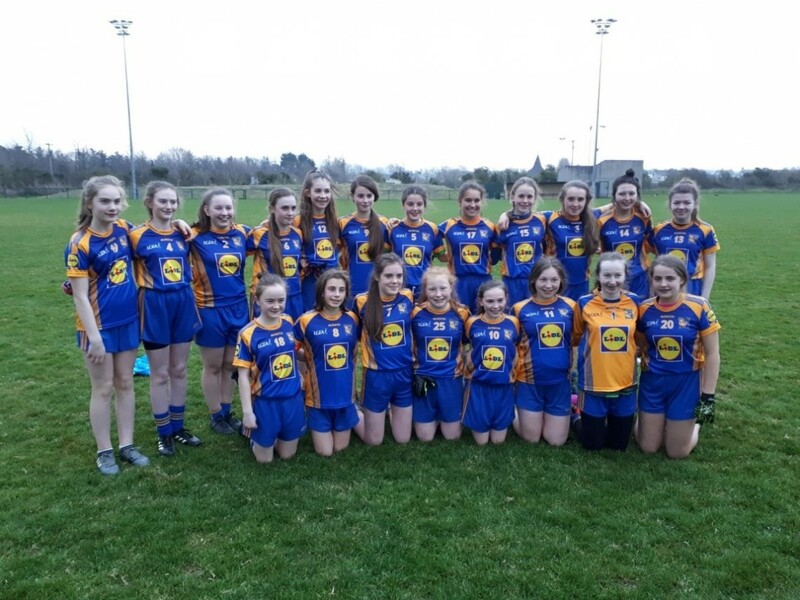 The U14 girls played in Abbeydorney last Sunday evening. We were treated to a very entertaining and sporting game of football. While the Ballymac girls played with great skill and accuracy, the strong running and physicality of Abbeydorney caused problems on the night . Half time score 1-9 to 4-0, having played most of the football in the 1st half we went in level. 2nd half was more of same, each time we pulled 3 or 4 pts clear Abbeydorney got goals. 3 goals from Roisin Rahilly, Ella Quirke and Christina Essnatt late in the 2nd half gave us the breathing space at the end. A big team performance: backs Anna Collins, Sarah Mason, Ella Quirke 1-1 & Ciara Kerins played well. Roisin Rahilly 1-3 & Ciara Palmer0-6 led the charge from midfield. Forwards Charlotte Geary 0-4, Rachel Creedon 1-2 & Kate Collins 0-1 were impressive. Subs Christina Essnait & Alice Brosnan made considerable contributions too on the night. 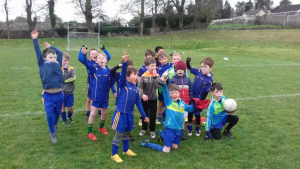 Southern Gaels next up in Ballymac 5th May , meanwhile non county player league continues Stacks come to Ballymac Sunday 14th and away to Cromane Monday 15th . On Saturday morning a compilation of our U14 panel and U12 girls competed against Austin Stacks B in Ballymac. Austin Stacks were much the better team and won on a score line of 3 12 to 02. Ballymac competed well all through, had some very good moves and were unlucky not to convert a few goal chances. On Tuesday our U12 team took on a very strong Abbeydorney team at home. Ballymac were leading half way into the first half and were only a few points down at half time after conceding a few goals just before the interval. In the second half we battled hard but eventually lost on a score line of 5 6 to 2 7.